Welcome back! 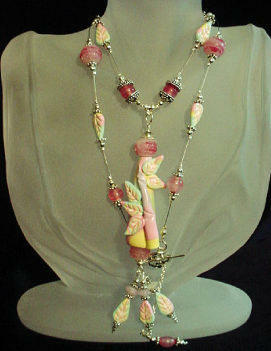 Mary continued adding new items of handcrafted jewelry and handmade crafts at MJ Crafts Design Studio. Remember that you can always see her latest handcrafted jewelry at the newly created Handcrafted Jewelry Page, and Handcrafted Jewelry Page 2. In the previous blogs I introduced the Handcrafted Semi-precious Stones Rings, the Handcrafted Swarovski Crystals Birth Silver Rings, the Handcrafted Faceted Swarovski Crystals Gold Plated Birth Month Rings, the Handcrafted Jewelry Pink & Purple Watch, and the Handcrafted Semi-Precious Kokopelli Watch 1. I also mentioned the Handcrafted Jewelry Pink Glass Beads Bracelet, the Handcrafted Jewelry Blue & Green Glass Beads Bracelet, the Handcrafted Jewelry Blue & Golden Glass Beads Bracelet, and the Handcrafted Jewelry Red & White Crystal & Glass Beads Bracelet. Also, I introduced the Handcrafted Polymer Clay Pastel Pendant Necklace, the Orange and Yellow Flowery Necklace, and the Handcrafted White Fish and Turquoise Necklace. Description: Handmade of Polymer Clay and/or Porcelain. Beautiful to decorate your garden and your interior plants. More characters and designs will be available soon! 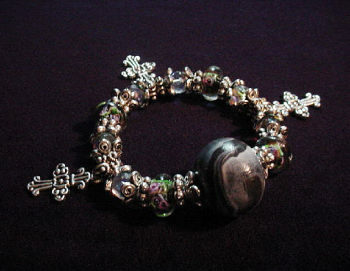 Description: Handmade polymer clay beads, unique glass beads, pewter and silver plated beads and findings. Each bracelet comes with a satin bag (pouch). Perfect for that special occasion gift! 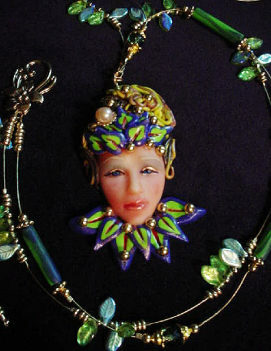 Fairy Face Green Necklace-another great Polymer Clay Necklace! Dimensions: About 18 inches long. 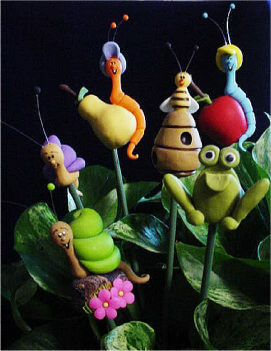 Description: Handmade with Polymer Clay. Findings, crimps and clasp are 14K gold plated. Gold plated Beadalon .018 in wire is also used. 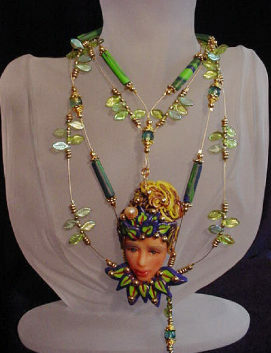 Glass and brass beads are used for final details. Water pearl for final detail. Unique design! Beautiful and unique for that special occasion. Many more creations will be coming out...stay in contact and don't forget to visit us often and check our new craft items and new items 2 pages for more impressive creations. Stay in touch! All Handmade Crafts & Handcrafted Jewelry - MJ Crafts Design Studio features the Eggypiece Art Collection, beautiful and funny FIMO Polymer Clay creations, and many more 100% handmade crafts made out of ceramics, porcelain, wire, beads, and polymer clay. 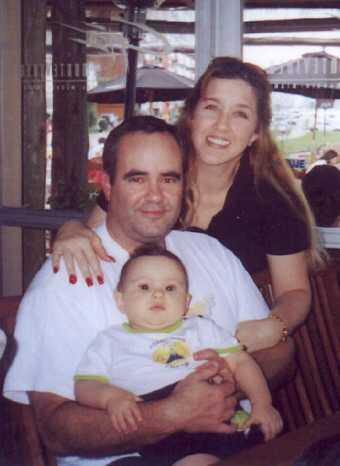 Very unusual! PayPal and Family Friendly. Come and Visit Us! Mary continues busy creating new handcrated jewelry and handmade crafts at MJ Crafts Design Studio. Remember that you can always see her latest handcrafted jewelry at the newly created Handcrafted Jewelry Page, and Handcrafted Jewelry Page 2. In the previous blogs I introduced the Handcrafted Semi-precious Stones Rings, the Handcrafted Swarovski Crystals Birth Silver Rings, the Handcrafted Faceted Swarovski Crystals Gold Plated Birth Month Rings, the Handcrafted Jewelry Pink & Purple Watch, and the Handcrafted Semi-Precious Kokopelli Watch 1. I also mentioned the Handcrafted Jewelry Pink Glass Beads Bracelet, the Handcrafted Jewelry Blue & Green Glass Beads Bracelet, the Handcrafted Jewelry Blue & Golden Glass Beads Bracelet, and the Handcrafted Jewelry Red & White Crystal & Glass Beads Bracelet. 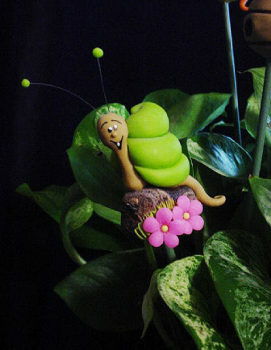 Description: Handcrafted with polymer clay. All findings, crimps, beads, bali beads and clasp are in sterling silver. Lampwork glass beads, Beadalon .018 inches silver wire are used for final details. Unique design! Dimensions: about 14 inches long. 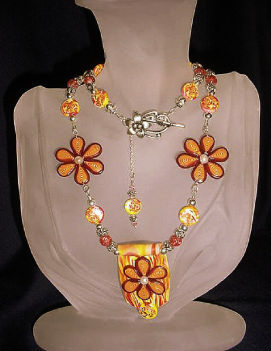 Description: Handmade Polymer Clay & Orange and Yellow beads. Handcrafted with Sterling Silver wire, crimps, chains and findings. Beadalon .018 in/19 stringing wire is also used. Embellished with fresh water pearls, crackle beads and Austrian crystals bicone beads for final details.Beautiful and unique for that special occasion. 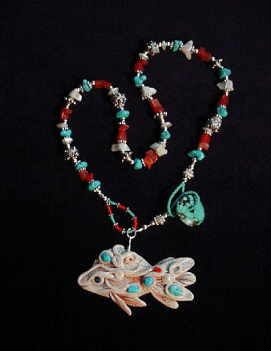 Description: Fish pendant handmade with polymer clay and embellished with Sleeping Beauty Turquoise Cabs. Fiber optic Orange and Mother of Pearls Beads are also used. Sterling Silver Bali Beads and findings. Turquoise medium doughnut is used as a clasp.Unique design!